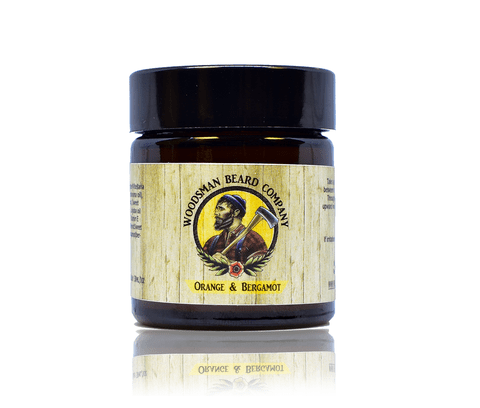 Review of Woodsman Beard Co Orange & Bergamot Beard Balm. Owner and creator Marc has made a slight recipe change to the products since I last reviewed for him. Now without a doubt the citrus scents are my favourite and so I was eager to try this product and it and I was not disappointed. A great idea here is that the balm is available as a vegan friendly product where the beeswax is swapped for Carnauba Wax and it is good because up until a few years ago there weren’t any vegan beard products in the UK and you had to purchase from an American brand. It doesn’t take much of the balm and it is easily worked into your beard hair and of course you must work it right in and down onto the skin under the beard and it left my wiry old beard feeling softer and gave it a medium hold. I prefer a balm as my beard is unruly and the Woodsman Beard balm did not dissapoint. There is no option when selecting the vegan balm option but there is a box to add special instructions in the shopping cart, so I take it you add ‘Vegan please’ or something like that? The balm is also available as vegan friendly where the Beeswax is swapped for Carnauba Wax. There is no option when selecting the balm but there is a box to add special instructions in the shopping cart, so I take it you add ‘Vegan please’ or something like that? Shea Butter, Bees wax, Vegan Carnauba wax, Jojoba Oil, Sweet almond oil, Vitamin E, Grape-seed oil, Sweet Orange & Bergamot.